Dr. Joel Thiessen (Canada’s younger version of Reginald Bibby) has done a Canadian study and found that society increasingly self-identifies as having “No religion”. Millennials are raised in a social context without a religion. Some might have gone to Sunday school or received baptism as an infant but end up as a non-attender of church. The United States and Europe are all generally in a similar situation. The U.S. might be a little better. This presents a challenge because people do not know who Jesus is. With this challenge comes the opportunity to socialize Christianity in a more positive way. The opportunity is that we get to start with a brand new slate. How we do share the love of Jesus to our friends, acquaintances, and family who are in this category of “Religious None”? If you are 50 or younger, you probably know someone who has never been to church and who has heard about Jesus spoken of at Christmastime or as a curse word. How do we share the good news of Jesus in this generation? With sensitivity to “None”s, or using the seeker-sensitive model? In a previous post, I blogged about a need for evangelization and missions to the margins. In this post, I will make a case for evangelization to the rich. The left will hate what I have to say here. Missionary families have sacrificed their lives and their comforts of home to live overseas, to adopt a new culture and learn a new language. Their motivation is to proclaim the gospel to people on the margins. They are on the margins due to income/economic status; sickness/health; race/ethnicity; language and education. Yes, even tax collectors repented and got baptized. During the days of the Roman Empire, tax collectors were people who were relied upon by civil government. The Roman Empire depended upon them to bring in tax revenues. Without tax collectors, they would not have been able to receive any monies to fund their public services. Thus, tax collectors were highly valued by the Emperor. It was unfortunate that they abused their positions of power. They took advantage of people. They added additional taxes to their collections that were not necessarily owed to Rome. They enriched themselves by pocketing that extra money for themselves. They were hated and despised amongst the common people. Some of these dishonest tax collectors were evangelized. They received Christ and transformed their lives. They gave up their dishonest ways, and were baptized by John. If there is room for the rich in God’s kingdom, who are we to judge? Zacchaeus in the bible was a dishonest man. He came to faith in Christ. In the gospels, he was repentant and transformed the way he conducted his business. He promised Jesus to give half of his money to the poor and return four-fold what he had cheated (Luke 19:8). Do we despise those who are rich and powerful? Are they also unfairly despised by some of us commoners. We accuse them of being oppressors of the weak. We accuse them of getting rich on the backs of the poor. Not necessarily true. There are many rich people who make their money honestly, and through hard work and diligence. Do we scorn the rich, famous and powerful for the sake of scorning them? When we do so, it creates a bigger chasm between them and the commoner. Do the ultra rich, powerful and famous also need to hear the gospel? Are they also loved by Jesus? They also have problems like us ordinary people. They also have marital troubles, divorce and separation, parental issues, just as we all do. Their lives can also be torn by sin and corruption. This sector of society also need Jesus. There is room for them in God’s kingdom. Here’s a question for us to consider. If Jesus invited himself to eat with Zacchaeus’ at his home, might Jesus do so with the ultra rich and powerful today? Most definitely. Our evangelization and missionary work today could use a good tweaking. We ought not only be evangelizing the poor and sick. We also need to turn our attention to people of influence. Missionaries are doing some great missional work to evangelize the marginalized. But what about politicians, and the rich business person? In a way, they might also be people on the margins–but on the other side of the margins? I’ll define this group as those who are on the margins on the opposite of the economic and social spectrum. We tend to marginalize them because of the division their money and wealth has created. I know it’s rather difficult to attach the label “marginalized” upon those who are rich. Juxtaposed with a large middle-class population, the super ultra-rich do standout as a marginalized group. In our modern contemporary society, we might consider people such as: the ultra rich, famous Hollywood stars, music icons, Supreme Court justices. These people might also be some of the loneliest people in the world. Their success in their own field of work has created a greater chasm between themselves and the common person. What would Jesus do? Jesus addressed rich people regarding their spiritual poverty. They were too content, too satisfied and did not seek after the things of God. Money satisfied them but they missed the spiritual side of life. To be fair, and on the other side of the same token, I believe Jesus would also speak to the poor people regarding their spiritual poverty. So whether we rich or poor, God would desire we all people to seek after godly and spiritual things. The ultra rich might be the most financially comfortable people in the world. But they might also be the most unhappiest people in the world. All human beings, regardless of our status, battle with depression, suicide, debilitating sicknesses and diseases. All people have marital breakdown. All people battle personal problems. God can be the savior of all people who need a savior. It is not unusual that the higher one climbs on the socio-economic ladder, the less happy and more lonely one becomes. So who might be the proverbial “tax collectors” of today? Might they also need to be ministered to? They might be our Hollywood producers, famous Oscar recipients, successful real estate tycoons, business persons and corporate executives. Let me ask you: When did you last minister to Hollywood producers, the political operatives, and business tycoon? Did you offer them any spiritual guidance? Were there any around who could share the good news with them. Most common people never have any sort contact with them. Why would we? And how could we? The marginal on this side of the bell curve are also isolated people. How can the gospel transform the lives of the rich, famous and powerful? This might be worth pondering upon. The gospel and the love of Christ can transform the lives of all persons. It might make the world a better place. Can they be transformed by the light of Christ to the glory of God? “Yes.” Jesus also wants to intervene in their lives. God loves all people of all economic and social status. If this post has made any sense, I hope it might present another challenge. How do we reach this other marginal group of the rich? Perhaps we might consider and pray that God should send evangelists, missionaries and apostles to the super rich, famous and powerful. The U.S. flag is seen as Pope Francis greets the crowd during his arrival to lead his general audience in St. Peter’s Square at the Vatican March 27. In the next several posts, I’m going to share a few things I wish the universal/catholic Church could be doing better, or more of. We all like and dislike what some of the Church is doing, and not doing. Most of what the church is doing is good. As the Church triumphant on earth, we’ve done a lot of good in this world. We have also done some not-so-good things. Moreover, we have not done enough of the good things that we could be doing more of. Back in 2009 during my early days of my blogging hobby, blogger Michael Spencer at Internet Monk (now deceased. God bless him!) had predicted that in ten years there would be a collapse of the evangelical Church. That was a very depressing and pessimistic thing to read. Well, thank God his predication did not come true. Parts of the wider North American evangelical Church have actually grown (e.g., Pentecostals and charismatics). Yoido Full Gospel Church in Seoul (Pentecostal), South Korea, is the largest congregation in the world with over 800,000 members. Started with only 5 people in a home church. On a worldwide scale, the evangelical Church has grown at a phenomenal rate amongst all denominations (including evangelicals, mainline Protestants, and the Roman Catholic Church). Churches in the Southern hemispheric countries have seen phenomenal rates of growth and revival. Praise God! Sadly, in churches in Europe and western nations, that is not the case. Dying churches choose to die because they have chosen to not do evangelism. I do hope and pray that denominations on the decline would awaken spiritually before they die out completely. God is a sovereign God. The Holy Spirit has a way of reviving Christ’s Church by introducing new movements. God graces us with charisms that utilizes all the gifts for the sake of the Church. As a result, God transforms Christian movements into new churches which eventually form new denominations. Newly established denominations become the new Mainline. Ironically, as lethargy sets into the new mainline, it develops new problems that have also plagued historic denominations. May God have mercy on us, the Church of Christ. Evangelical Protestant churches declined from 26.3% to 25.4%. Note that modern evangelicalism is only 50 years old. The Catholic Church declined from 23.9% to 20.8%. Mainline Protestant churches declined from 18.1% to 14.7%. The thing that strikes me is those who identify themselves as Unaffiliated. It increased from 16.1% to 22.8%. That’s a 6.7% increase! What the universal/catholic Church is not doing enough of is evangelism. In 2006, Pope John Paul II called for a New Evangelization. 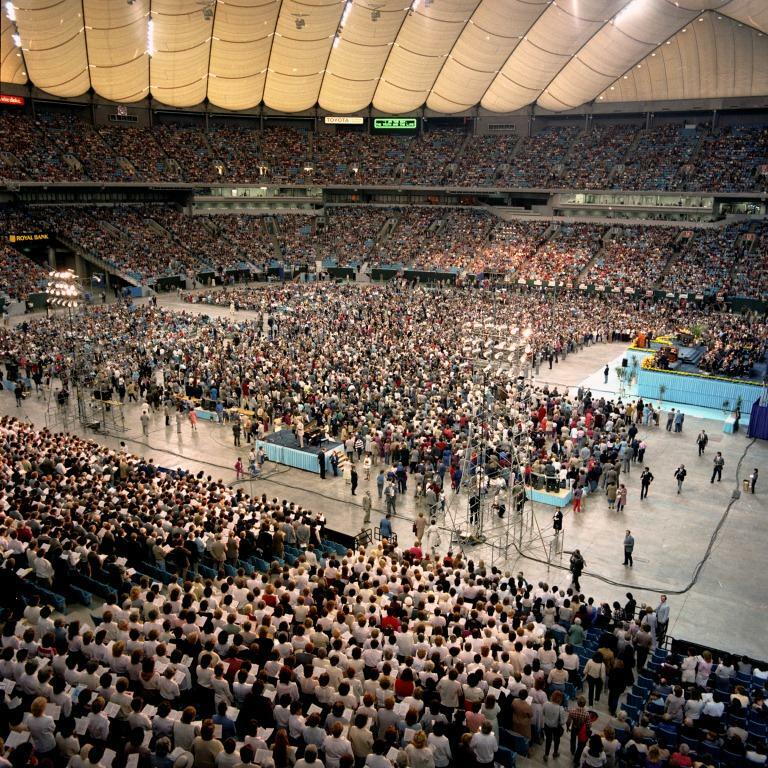 It was a radical call to proclaim the gospel in our world. Pope Francis XVI has continued to echo this call for this New Evangelization (here). See document: titled “Evangelii Gaudium” (The Joy of the Gospel). Some churches/denominations have taken a reactionary approach. They do evangelism for self-preservation. Efforts are a desperate attempt to survive. Sad fact here. As historic congregations gray-out in the pews, they survive by drawing from the equity of building and property values. Many of our mainline Protestant denominations are dying a slow but steady death. They offer the excuse that their children have moved away from home and living elsewhere. Another sad fact. Many of their children are not attending church after they have moved away. It’s a sad but hard fact to swallow. It pains them when they are reminded of it. If our general population is increasing, shouldn’t church attendance also be increasing? As institutional churches (or denominations), we have been neglecting some good things we could be doing more of (as I mentioned earlier on): re-evangelizing the generations of unchurched people.